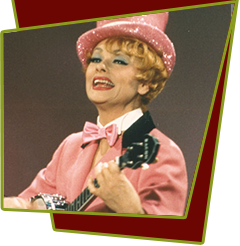 This NBC Musical Comedy features Lucille Ball playing herself, retired but talked back into show business by NBC president Fred Silverman (satirically played by Gary Imhoff). Congratulations are proffered in guest spots by Bob Hope, Johnny Carson, Gene Kelly, Jack Klugman and Gary Coleman, cast as a network programming VIP. Lucy's hired by NBC Network to create a new comedy series with the help of her production assistant, Gale Gordon. They come up with a variety show a la The Partridge Family, headlined by Donald O'Connor and Gloria DeHaven. The two play owners of a music store and have a teenaged son devoted to rock music. What evolves is a spoof of TV decision-making as well as long dance numbers highlighted by O'Connor's medley from the movies, an O'Connor-Ball duet set to 'A Real Live Girl' and a rousing banjo solo performed by Scott Plummer. Special Notes: After nearly thirty years at CBS, Lucy dissolved her partnership and switched to NBC, which was scandalous at the time. NBC was willing to allow Lucy to produce new programs starring actors other than herself. Although promising, it only resulted in this one special and several guest appearances on Bob Hope specials.